It seems odd to me that there's no review for High-Profile Target yet, as it seems really strong to me in tag-heavy decks, such as when using any NBN deck, really. In my opinion, SYNC: Everything, Everywhere is the best choice here, though an argument can be made for NBN: Making News. All it takes is 3 tags to win the game with one use of HPT on regular hand size. 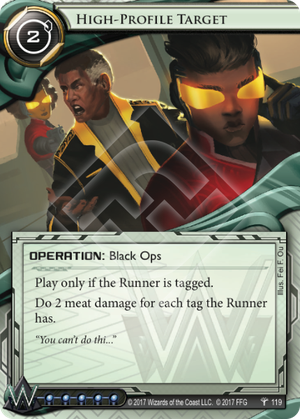 Hard-Hitting News makes for an especially deadly combo, as it forces the Runner to pay 4 credits, or 6 when using SYNC to avoid the risk of certain death the next turn. Your options for ICE are Thoth, Data Raven and Gutenberg for tagging. IP Block for dealing with pesky AIs and also to stop tagged Runners. Pachinko is an obvious choice, but Endless EULA is great, especially for economic reasons. Consider using Sub Boost to give your taggers the ability to end turns on top. Escalate Vitriol, Quantum Predictive Model and Net Quarantine are good agenda options, with Fly on the Wall being a must-have, considering it's one of the few cards to allow you to tag without tracing during your turn.